Enhancing the diagnosis of breast cancer is the stated goal of a research team at the German Cancer Research Center (DKFZ) in Heidelberg. The scientists have combined an advanced method of diffusion-weighted MR imaging with intelligent image analysis methods to detect malignant changes in tissues. This method may help avoid many control biopsies following suspicious findings from mammography screening, the scientists have now demonstrated in a study that was supported by the Dietmar Hopp Foundation. This advancement holds promise for substantial improvements in the diagnosis of breast cancer. Mammography is one of the key methods used in breast cancer screening. It is a special type of X-ray examination of the breast that can show changes in tissues. Each year, approximately 2.8 million women have a mammography as part of the breast cancer screening program in Germany. However, the results are not always easy to interpret. Therefore, about one in 20 women who undergo mammography screening can expect a suspicious finding. If further tests indicate a possibility of cancer, physicians usually recommend taking a tissue sample, or biopsy. "Nearly 35,000 women every year face this situation," says Dr. Sebastian Bickelhaupt, a radiologist at the DKFZ. "However, in only about half of these cases is a malignant tumor actually found." Bickelhaupt and his colleagues have therefore optimized a method called diffusion-weighted MR imaging (MRI) for examining the female breast and combined it with intelligent computer-based image analysis methods. Diffusion-weighted MRI is a special technique that makes it possible to see the movement of water molecules in tissues and to observe it using a computer algorithm. Malignant tumors change the structure of tissues, thus causing changes in the movement patterns of water molecules. This link might be utilized in the early detection of breast cancer – without the necessity to take tissue samples or use contrast agents in the body. "Our goal is to obtain better noninvasive insight into the interior of the body and thus provide additional information about tissues for clinical evaluation by radiologists, along with the standard methods, which will continue to be relevant," said Bickelhaupt. 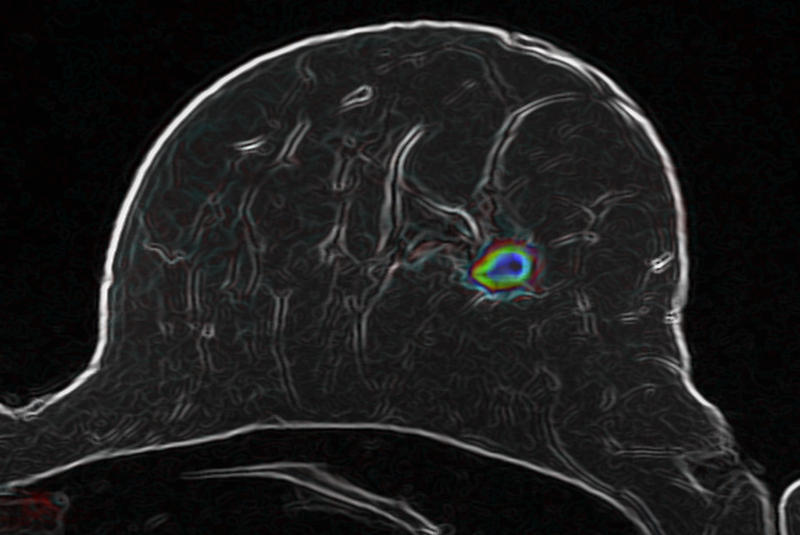 Now the DKFZ researchers have demonstrated in a study that was supported by the Dietmar Hopp Foundation that optimized diffusion-weighted MRI in combination with intelligent image analysis methods does in fact allow reliable assessments of malignant changes in the breast. In their study, the researchers examined 222 women who were recommended to have a biopsy after a suspicious mammography finding. Prior to the biopsy, the researchers used their newly developed method to analyze the breast tissue of study participants. Their results were very promising: The new method enabled them to reduce the number of false positive findings in the study group by 70 percent. The scientists were able to identify truly malignant changes in 60 cases out of 61. This sums up to an accuracy of 98 percent and is comparable with the reliability of MRI methods that use contrast agents. "We use our own specially developed intelligent software to evaluate the images," said Paul Jäger, a computer scientist who shares the initial authorship of the study with Bickelhaupt. "This makes the method largely independent of interpretation by individual physicians." In this way, constant reliability of the method can be assured at different study centers. In a next step, the method must prove its worth in larger multicenter studies before it can be used as a routine method in the clinic. The scientists are currently building the collaborations that are needed for these larger studies. "If our result is confirmed in future studies, we will have an additional diagnostic tool available that will enable us to further enhance the early detection of breast cancer," Bickelhaupt said about the promise that the new method holds. Use is free of charge. The German Cancer Research Center (Deutsches Krebsforschungszentrum, DKFZ) permits one-time use in the context of reporting about the topic covered in the press release. Images have to be cited as follows: "Source: Bickelhaupt//DKFZ".